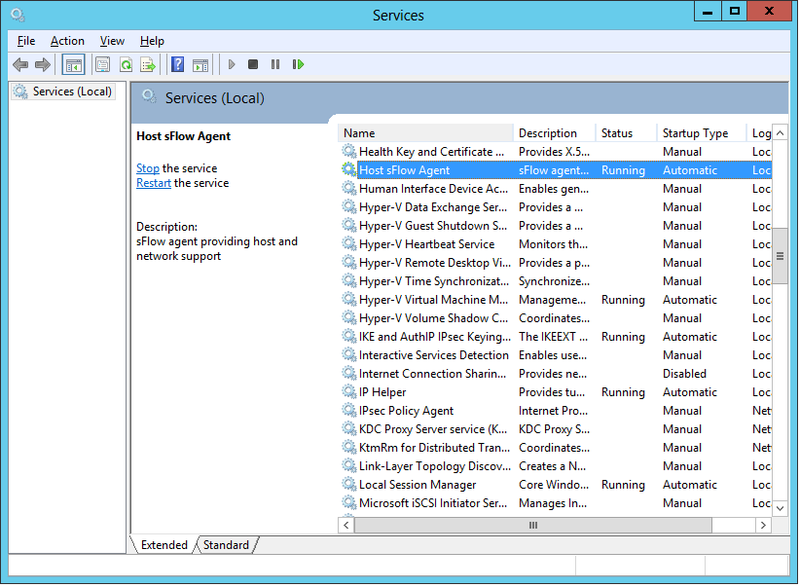 The public beta of Windows Server 8 is now available for download. 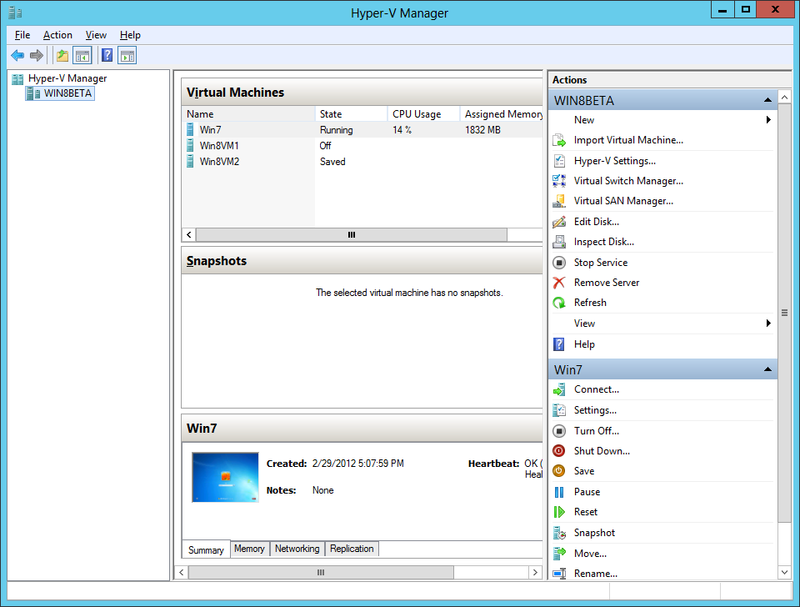 Windows Server 8 contains significant enhancements to support virtualization and cloud computing. 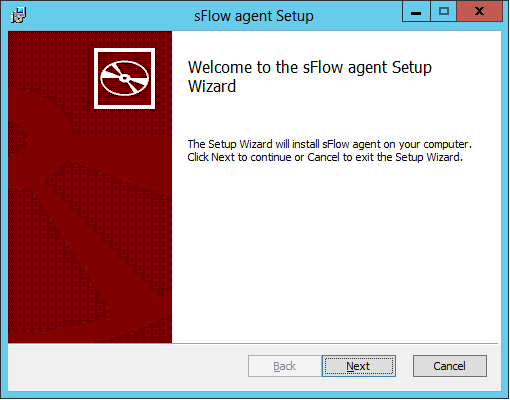 This article describes how sFlow standard monitoring can be installed and configured to manage the performance of large scale Windows Server 8 cloud deployments. 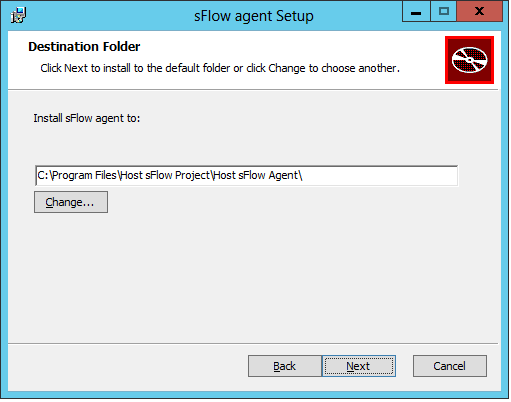 With sFlow monitoring, each server sends performance measurements to a central analysis application - in this example the sFlow analyzer has address 10.0.0.50 and each Windows 8 server will be configured to send sFlow to this address. Click the check box to accept the license and then click on the Next button. Click the Next button to accept the default installation location. 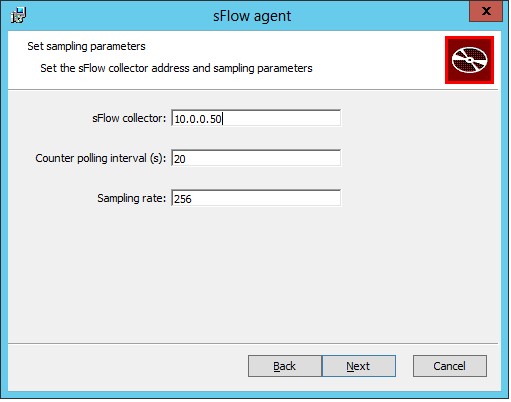 Enter the IP address of the sFlow collector, a Counter polling interval and a Sampling rate. In this case the sFlow collector has address 10.0.0.50. The default polling interval of 20 seconds and default sampling rate of 1 in 256 should be suitable for most installations, see Sampling rates for more information on choosing sampling and polling setting. Click on the Next button to accept the settings. Click on the Install button to start the installation. 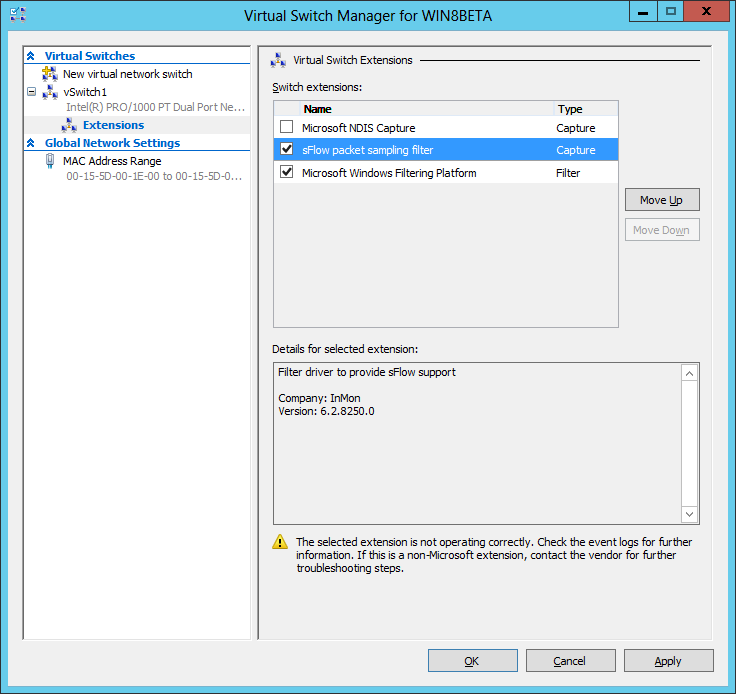 After a few moments you will be prompted to install the network monitoring driver, see Hyper-V extensible virtual switch. Click to check the Always trust software from "InMon Corp." box and click on the Install button to install the driver. Once the installation is complete, you should see the following window. There is one final step to configure monitoring of the virtual switch. 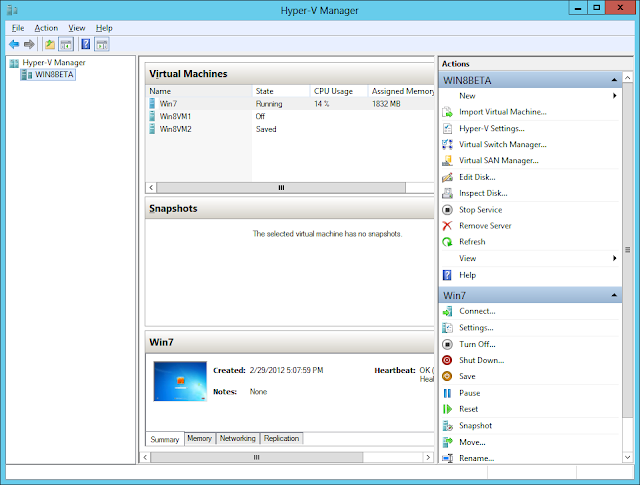 On the Start screen, type hyper-v manager to launch the Hyper-V Manager application. 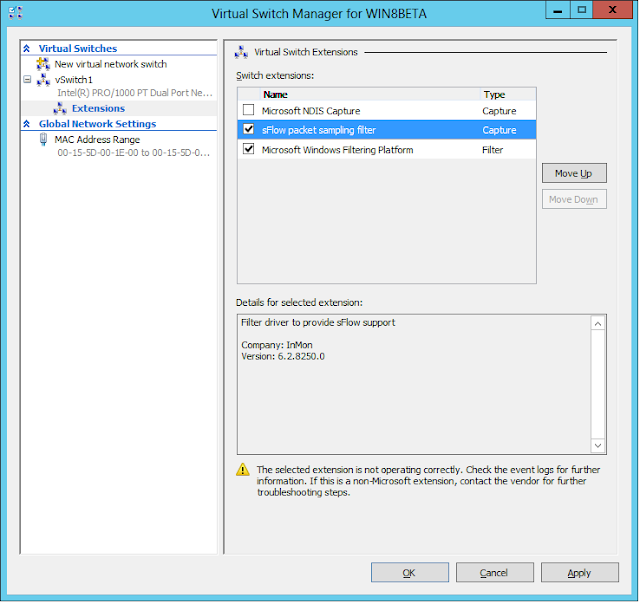 Click on the Virtual Switch Manager... in the Actions column on the right to launch the Virtual Switch Manager. Expand each virtual switch, click on Extensions and enable the sFlow packet sampling filter (in this case for vSwitch1). At this point the sFlow software installation and configuration steps are complete and you should start seeing data in your sFlow analyzer. Use the Registry Editor if you need to change the sFlow configuration settings: the IP address of the sFlow analyzer, the polling interval, or the packet sampling rate. On the Start screen, type regedit to launch the Registry Editor. Double-click on a setting to edit its value. 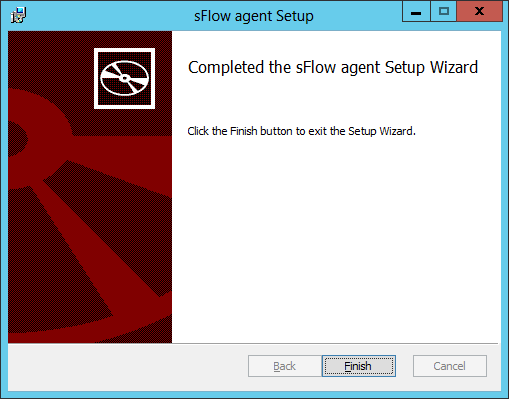 Once the settings have been changed, the sFlow agent needs to be restarted before the changes will take effect. On the Start screen type services to run the Services manager. 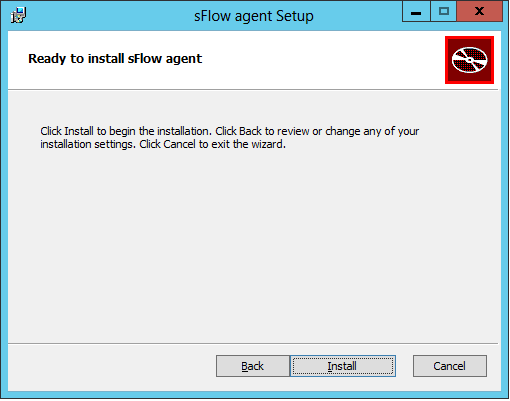 Select the Host sFlow Agent service and click on the Restart link (or use the right button menu option). 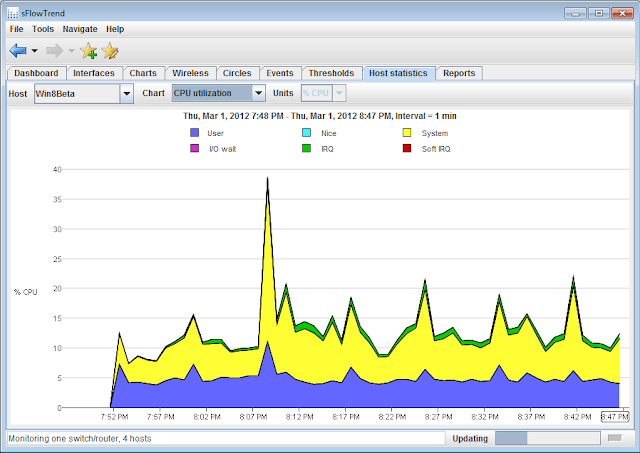 The following charts use the free sFlowTrend tool to demonstrate some of the performance metrics reported from Windows Server 8. 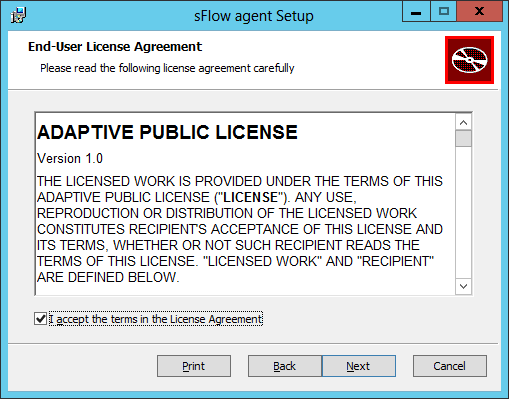 However, there are many other open source and commercial sFlow analysis applications, see sFlow Collectors. The following chart shows the top network connections flowing through the virtual switch. It is easy to see that the bulk of the traffic is associated with Windows file sharing. The chart provides a minute-by-minute view of network activity based on measurements made by the driver installed in the virtual switch. 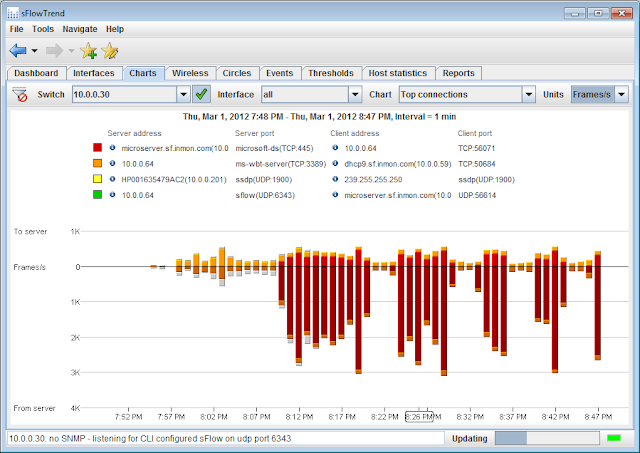 The next chart shows the CPU utilization on the server. The processor utilization is averaging at just under 15%, with a brief peak of 40%. Based on this chart, it looks like there is plenty of capacity to run additional virtual machines. 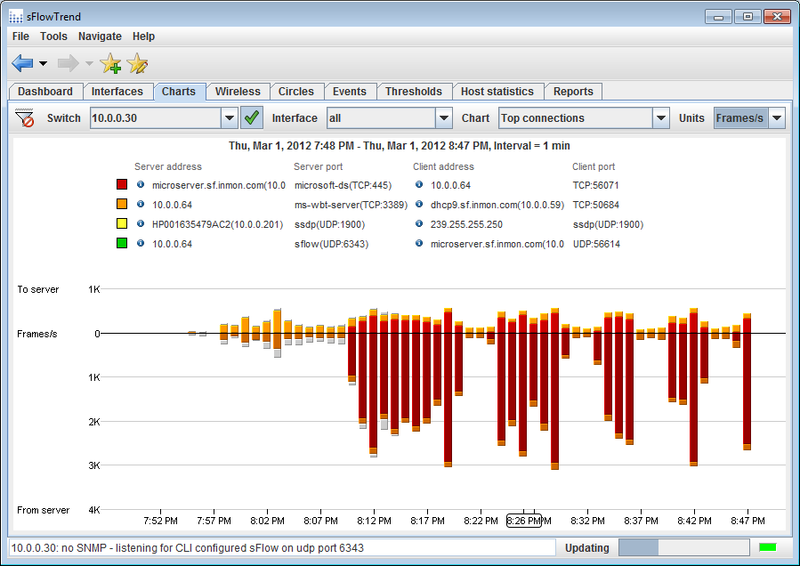 The final chart in this example shows disk activity for the server and each virtual machine. 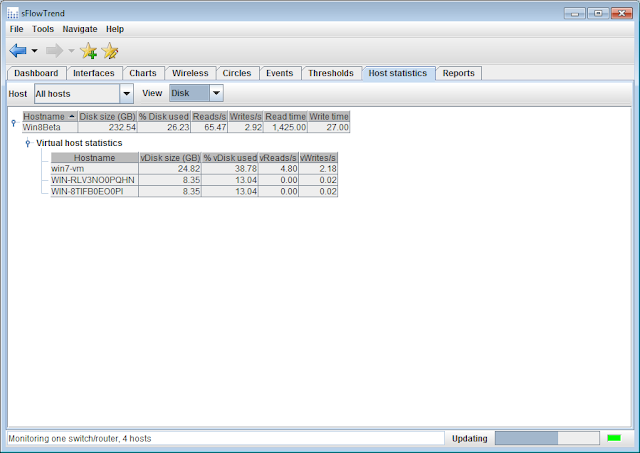 The physical servers and the virtual machines are all shown, along with key disk performance and usage metrics. Again, the numbers suggest that additional virtual machines could be added without impacting performance - the disk is only 26% used, there are only 3 virtual machines deployed, and there is very little disk IO activity. The sFlow standard is widely supported by switch vendors. 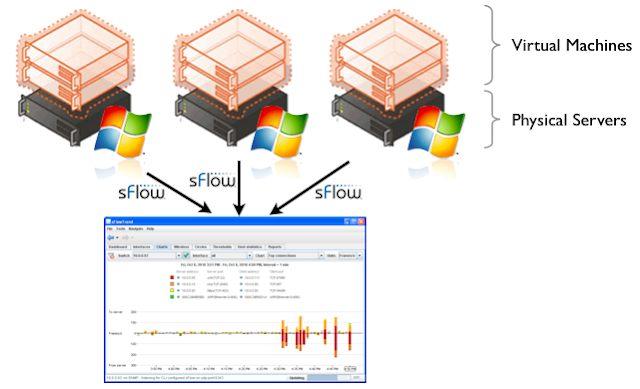 Using sFlow to monitor the Windows Server 8 extensible virtual switch simplifies management by allowing a common set of tools to monitor physical and virtual network performance. Performance management is further simplified since sFlow also provides an efficient way of monitoring server and virtual machine statistics. Unifying network and system monitoring provides the integrated view of performance needed for the coordinated management that is essential in virtualized environments. In addition to monitoring data center resources, sFlow can also be used to monitor performance within public clouds (see Rackspace cloudservers and Amazon EC2), providing the integrated visibility needed to optimize workload placement and minimise operating costs in hybrid cloud environments. For public or private cloud operators, support for sFlow in the Hyper-V extensible switch and the Open vSwitch embeds visibility in leading commercial hypervisors (Microsoft Hyper-V and Citrix XenServer), open source hypervisors (Xen Cloud Platform (XCP), Xen, KVM, Proxmox VE and VirtualBox) and cloud management systems (OpenStack, OpenQRM and OpenNebula), providing the scalable visibility needed for accounting and billing, operational control and cost management.